Some friends invited me to dinner this past Saturday evening. I enjoyed myself so much. I think I have mentioned before how much it means to a chef (at least to this chef) to be invited to dinner in someone's home. I appreciate how intimidating it can be to prepare food for a chef. Frankly, I am intimidated when I cook for my chef friends. But a home cooked meal, shared by friends, is one of the best things in life. I treasure the moments spent at the tables of my friends. My contribution to our meal was dessert. 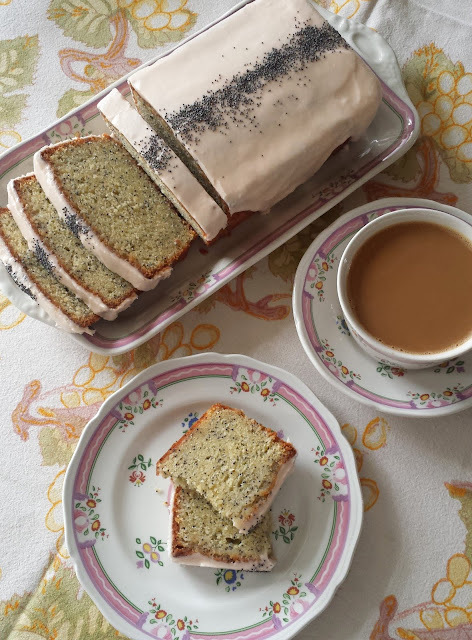 A little over a year ago, around the time I first started blogging, I discovered a simple little buttermilk tea cake at Cannelle et Vanille. Over the past year I have made enough adjustments to the original recipe that some might not consider the cake I make to be the same recipe at all (a little more flour...a little less butter...a little less sugar...). But my cakes are very much inspired by the beautiful little cakes I found at Cannelle et Vanille, so I wanted to give credit to the source of my inspiration. In any case, it was a version of these cakes that I took with me on Saturday evening. The original cakes posted at Cannelle et Vanille contain fresh raspberries and pistachios. 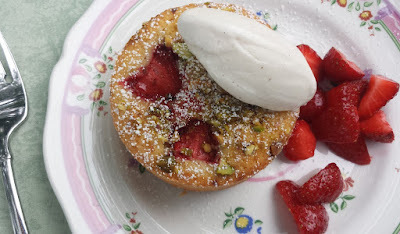 But because it is rhubarb season—and I had some rhubarb from the market on hand—I made my cakes with rhubarb and pistachios. The only difficulty with making this substitution is that rhubarb releases a lot of liquid when it is cooked. This can sometimes result in a damp or heavy cake. Because there is only a small amount of fruit in the cake, there was probably not too much risk in adding the fresh diced rhubarb directly to the cake batter (the same way the fresh raspberries are added). But rather than risk the disappointment of a gummy cake, I gave the rhubarb a little pretreatment to reduce the amount of liquid released. For a detailed explanation of my method for the rhubarb, check out my post from last year on Rhubarb Streusel Coffeecake. I didn't go on a picnic this weekend, but if I had, I might have made these cakes for that too. They of course make a lovely plated dessert, but they don't really require the addition of ice cream (or any of the other nice garnishes once could come up with—softly whipped cream, a dollop of mousse, fruit compote or sauce, etc.). They are perfect for a picnic because they can be easily packed and are pretty nice simply eaten out of hand. Because the cakes have a slightly higher percentage of butter and sugar (even after I reduced the quantities of both these ingredients) than is typical for a butter cake, they are very moist and tender just as they are. Given the simplicity, versatility and portability of thes cakes, they make a great impromptu dessert to make whenever you need a dessert to take to a casual party, pot luck or picnic. They are, it seems, the perfect little cakes for summer. I made them twice over the Memorial Day weekend—the "unofficial start of summer"—and anticipate that I will make them for more than one occasion in the months to come. Because even though it has been many years since the "start of summer" meant having the luxury of a long holiday stretching out endlessly before me, I look forward with much anticipation to the long evenings of the summer to come, many of which I hope will be spent lingering around a table shared with my friends. The night before you plan to make the cakes, place the rhubarb in a small bowl and toss with 1 1/2 T. sugar. Cover and refrigerate overnight. Drain the rhubarb in a fine meshed sieve set over a small sauté pan (just large enough to hold all of the rhubarb in a single layer). Press on the rhubarb to squeeze as much liquid into the pan as possible. Set the rhubarb aside on a plate. Bring the juice to a boil over high heat and reduce to a syrup. Remove from the heat and add the rhubarb; toss to coat. Return the pan to high heat and cook without stirring until any remaining liquid exuded by the rhubarb has evaporated—the rhubarb will not be cooked at this point; it will still be crunchy. Set aside and cool to room temperature. Scoop out 1/4 cup of the rhubarb and reserve separately from the rest. Preheat oven to 350°. Butter and flour ten 6 oz. ramekins. Set aside. In a small bowl, combine the flour, baking powder and salt. Whisk to combine and aerate. Set aside. Cream together the butter, brown sugar, granulated sugar, orange zest and vanilla extract until light and fluffy. Beat in the eggs one at a time, scraping down the bowl after each addition. After adding the last egg, scrape down the bowl. While mixing in low speed, add a third of the dry ingredients to the bowl. Follow with half of the buttermilk. Add another third of the dry ingredients followed by the rest of the buttermilk. Fold in the last third of the dry ingredients by hand, adding the reserved rhubarb (about 1/2 cup) with this last addition. Mix just until well combined. Adding the blueberries for the Blueberry-Pecan Variation (see below). the flour is incorporated) prevents over mixing. Divide the batter among the 10 molds (an ice cream scoop works well for this), filling each half way with batter. Sprinkle the nuts and reserved 1/4 c. of rhubarb over the cakes. Bake until light golden brown and a toothpick inserted in the center comes out clean—about 25 to 30 minutes. Cool the cakes in their molds for 10 minutes before turning out and cooling completely on a wire rack. OOH, I must try this! I just bought some buttermilk because I wanted to make something sweet, but I'm kind of tired of my old recipes. This sounds delicious!